With how hot (geddit?) 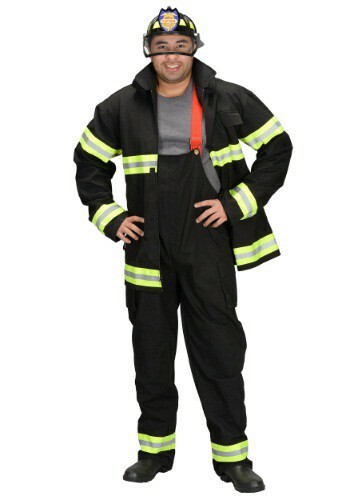 you’re gonna look in this Adult Black Fireman Costume w/ Helmet, you’re gonna have to put out fires all over the place! Isn’t it kind of ironic that a Fireman’s occupation is to literally put out fires, and yet they’re legendary for being the hottest American heroes around? But no need to think too deeply on that - let’s just accept it as fact and get you suited up for a super hot night in this Adult Black Fireman Costume w/ Helmet! Made of 92% cotton, 3% leatheroid, and 5% polyester construction, this Adult Black Fireman Costume w/ Helmet is made up of thick, durable material that looks like real firefigher gear! The jacket zips up the front and secures with metal clasps, and it also features 4 functional pockets on jacket front. The neck closure secures with Velcro, and the bib style overalls have elastic suspenders. The real buttons and straps allow you to fit the pants as tight or loose as you desire, and the functional cargo style pockets on the pants make them easy to carry around your stuff without losing the fireman feel! The costume even comes complete with a plastic costume helmet! Just add some boots and maybe a toy hose or axe as a handy accessory, and get ready to burn down the house in this Halloween!